London Telegraph – The giant advertising hoardings in the Tennessee cities of Memphis, Nashville, St. Louis and Fort Smith, Arkansas show a mischievous-looking young girl writing her letter to Father Christmas: “Dear Santa, All I want for Christmas is to skip church! I’m too old for fairy tales,” she writes. The advertising campaign by the American Atheists group will run until Christmas Eve and is the first time the group has aimed its anti-God adverts directly at residential religious areas, having previously targeted urban audiences in big venues such as Times Square in New York. “Today’s adults have no obligation to pretend to believe the lies their parents believed. It’s OK to admit that your parents were wrong about God, and it’s definitely OK to tell your children the truth,” said David Silverman, the group’s president, as he launched the campaign. What is the true purpose behind this billboard campaign? 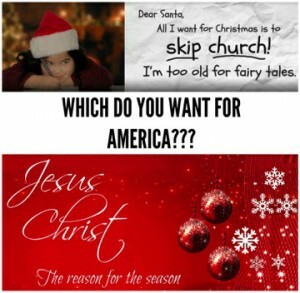 Other examples of the Godless push in America and where it’s coming from. Lea Carawan is available for your show this week. To book an interview with Lea please contact CJ Wheeler at cj@bookitcj.com or 858-472-4285.